Published: Apr 4, 2014. 15:33 +0100. We are big fans of SiteGround and their developer features. This hangout introduces their new more advanced version of the SiteGround Staging Tool. The tool allows you to copy your website quickly your website, make changes to the copy, and then push those changes to live once you are happy with it. Feel free to watch the replay of the Google Hangout below, but we have also included a summary of what was said below for quick reference (not everyone has the time to sit through a one hour video). We have used the Site Staging extensively, so if you have any further questions feel free to post in the comments below. Alternatively, SiteGround’s live support is also extremely helpful. 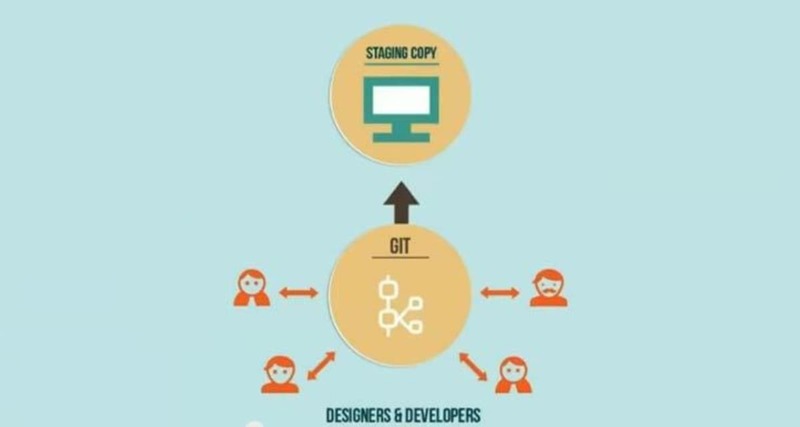 Why Use a Staging Environment? You won’t break your live website when making changes. You won’t show your visitors unfinished designs. Makes testing much easier and gives more freedom to try new things without worrying about breaking your website. No additional configuration is needed (one click setup). It is great for design and development teams, as well as the casual blogger. It is safe (backups taken before changes pushed live, with easy restore). If you have installed Joomla or WordPress manually rather than through the SiteGround installation script, then just click the “Add Joomla” or “Add WordPress” to add those websites. You will then be asked if you want to password protect the staging copy. This is important to prevent search engines indexing your staging copy (bad for SEO), and also to prevent your unfinished work being read by your visitors. If you have followed this process on the video, you will see that this whole process took less than 2 minutes (with commentary added). 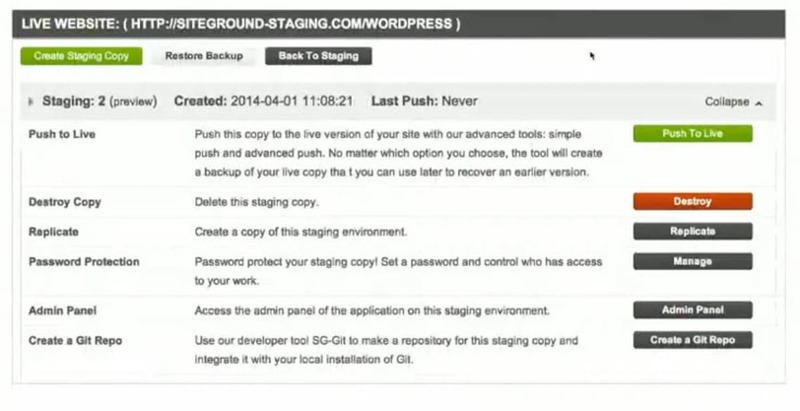 You could easily setup a staging copy in about 20 seconds! You can then start working on the staging copy by clicking on “preview” in the top left-hand corner under “Create Staging Copy” button. You will have to enter your password if you set up password protection. This pushes all the changes made to the staging website. Any changes that have occurred to your live website since creating the staging copy will be lost. This will allow you to see all the differences between your live website and your staging copy and let you choose which ones to apply. Push to live. © SiteGround. Staging push options. © SiteGround. If you chose the Easy Push, a few seconds later your changes will be live. As you can see above, in the “Changes in Databases” table you can de-select the comments (as one example) to avoid overwriting all your comments on the live website. Why use the Advanced Push? 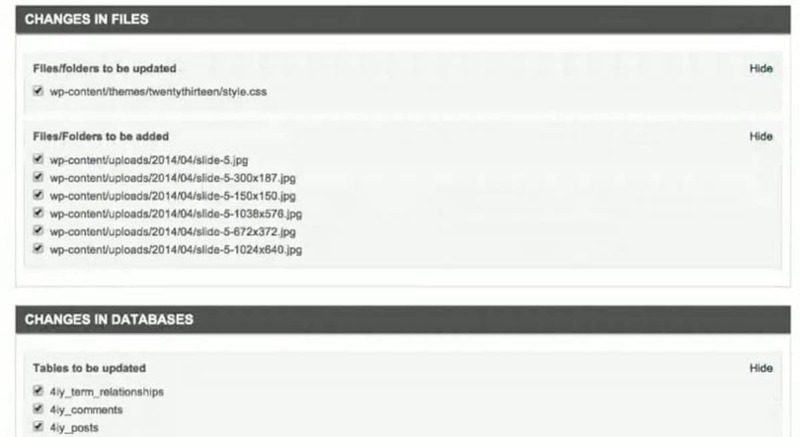 Sometimes there is data that continues to be entered on the live website after you make the staging copy, for example, comments, or in the case of online store orders. In these situations, you will want to use the Advanced push to ensure you preserve any data that needs to be kept. The backup is restored in seconds. The GIT repo can be created with one click, and then you get all the information you need to access the repo in a pop-up box within a few seconds. Easy staging copy replication — This is useful if you have some changes in your staging copy, but want to experiment with further changes without messing up your existing staging copy. Easy password protection so you can control who can make changes. Q. How does the Staging work with Plugins? A. The staging tools make a full replica of your website that includes plugins. Q. Can you develop a website on your server and then push straight to a client server? A. At the moment, this is not possible, but it is a feature on the roadmap to implement hopefully in the next version an option to split it to a client account. Q. Does this work with WordPress Multisite? A. Yes, but you can’t distinguish between each sub-account. Q. Is there an extra charge for this capability and is it offered on all hosting plans? A. There is no charge, but it is only available on the GoGeek hosting plan. Q. If a database is larger than 100MB can we use the tool? A. Yes, but you will need to sign up to the VPS plan. Q. Does the staging tool support SSL certificates? A. At the moment, it does not. You should develop in regular HTTP. Q. What happens when you edit a website that other people can contribute to? A. You can use the advanced website push tool to deal with this, so you don’t overwrite individual database tables, such as comments. Q. Can you do a total website redesign with the Staging Tool? A. Yes, but you won’t be able to change the CMS. Q. Is this feature available on your dedicated servers? A. Staging tool is available on the dedicated servers but you need to purchase an additional upgrade, and we will install it on the server. Q. Does it work with SEO plugins and friendly URLS? A. Yes, it works with all these types of plugins. Q. If I have a 1.5 or 2.5 existing Joomla website, can I build a new 3.2 website in a staging environment and then after all content is updated in staging push it to live status? A. Yes, such migrations are quite time-consuming and require a lot of testing. That’s why our staging tool is often used for Joomla migrations from one version to another. Make sure that the initial push you make is a simple one. Q. How do I add this feature to my reseller accounts? A. Right now, this feature is available only on our GoGeek accounts. If any of your reseller accounts needs it, it must be upgraded to the GoGeek plan. Q. Will I see the replicated files in FTP / cPanel so I can edit those? A. Yes, you can modify the replicated files (your staging copy) through FTP, the File Manager tool in your cPanel or even via SSH. Q. Do you create a new username and password or use the original one? A. Since the staging tool is replicating your live website completely, the login details for your Joomla/WordPress website are the same. A. Right now the tool works only with Joomla and WordPress, but we plan to add more supported apps. Magento is surely the first app on that list. Q. My assumption is that the staging copy (or backup) is on a physically different web server from my website. A. No, your staging copy is generated on the same account your live website is hosted on so you can quickly access and modify its files and database. As we said before, there is a little more detail in the video, so you may find that useful to watch. You can also read a more general overview of all the other developer tools available on SiteGrounds GoGeek plan here.